WHY GO: The iconic statue, “The Man At the Wheel” defines Gloucester MA past and present. Sporting foul weather gear, the Fisherman’s Memorial, erected in 1923, lists the thousands of Gloucester mariners lost at sea. 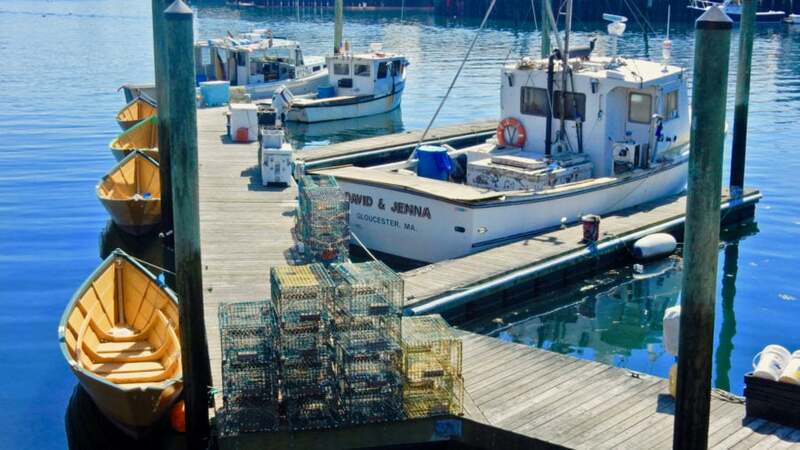 Home port of the Andrea Gail – the fishing boat that went down with all hands, immortalized in the book and movie Perfect Storm – Gloucester still harbors an edgy, working-man, risk-taking vibe. The movie was shot in part here, as was Manchester By the Sea (a town just Southwest of Gloucester whose community members wanted no part of Hollywood hoopla). But Gloucester has an artsy side as well. Rocky Neck, a peninsula that forms one side of the inner harbor, became an art colony in the early 1900’s, drawing wealthy New Yorkers and Bostonians to its craggy shoreline. An overnight Getaway here will draw you in as well. Read on. PHOTO OP: Fisherman’s Memorial – AKA The Man At the Wheel. Travelers of a certain age might recognize this statue from the old “Trust the Gorton’s Fisherman” commercial. (Gorton’s Seafood’s headquarters is here). Take a few moments to read the plaque, commemorating the nearly 5,500 fishermen who perished at sea. From 1623, when Europeans first began fishing these waters, to the 1800’s when “immigrants from many lands joined in the perilous work,” until today, Gloucester’s commercial fishing families head out in dangerous weather to bring in the catch. In the past, Gloucester was known for cod, halibut and mackerel. Now, it’s the largest lobster port on the East Coast. VISIT: Stage Fort Park/Gloucester Visitors Center. The lovely stone “Rest House,” built in 1923 overlooking the Atlantic Ocean, was once a place to warm up in front of the fireplace, or shower after a long hike. It now serves as the Gloucester Visitor’s Center, with unparalleled Atlantic Ocean views from the porch. You’ll find helpful volunteer staff and lots of brochures and material about the town. DRIVE: Rocky Neck. This peninsula of Gloucester Harbor has been attracting artists since the late 1800’s. Take a drive, and be sure to hit up the innumerable artist studios along the shoreline’s nooks and crannies. TOUR: Beauport/Sleeper-McCann House, on Rocky Neck. Constructed in 1906 by one of America’s first professional interior designers, Henry Davis Sleeper, this unsung yet remarkable waterfront mansion is known among greats in the trade, but it should be known to all. Here’s why. A gay “confirmed bachelor,” and grandson of a textile tycoon, Sleeper lived in Boston with his widowed Mother and came often out to Rocky Neck, invited by friends who had cottages on the water. By 1908, his 26-room summerhouse was completed. Sleeper lived here for 27 years, continuously changing and rebuilding the abode that would become the showcase for his Interior Design practice in Boston. An unabashed collector, Sleeper was not interested in the provenance of pieces; his concern was how they looked together in a room, creating focal points and interesting displays. By the time of his death (with no heirs) in the 1950’s, the home had expanded to 43 rooms – with 5 dining rooms alone. Henry’s brother sold the heavily mortgaged property to the McCann Family from Long Island NY. McCann left the house to the Society for the Preservation of New England Properties, now Historic New England, as it was when Sleeper owned it, down to the vignettes on tables. A tour here brings visitors from room to room to see Sleeper’s application of architectural salvage (no one was doing that before then) in paneling and beams, his collection of George Washington likenesses, his 137 piece amber glass collection, and themed rooms, one, a favorite of Helen Hayes, a frequent guest. Sleeper’s romanticized version of a Colonial Kitchen became one of his most requested designs. Anyone who has ever been to DuPont’s Winterthur in Wilmington DE might notice direct similarities between the properties, which is no coincidence. As the interior designer of the day, Sleeper consulted with Du Pont on his mansion turned museum. Several rooms, including the Red Indian Room and Golden Step Dining Room feature picture windows and porches with direct harbor views. The China Trade Room is clothed in 1700’s wallpaper, discovered after 130 years in a Marblehead attic, still in its original wrapping. Apparently, Robert Morris, signer of the Declaration of Independence, had ordered the hand-painted paper, yet ultimately could not afford it. Sleeper used the gorgeous Asian-themed wall covering to greatest effect. One hour tours of 26 rooms $15, 3-hour Nooks and Crannies Tour, $35. VISIT: Cape Ann Museum of Art, History, and Culture. Who knew there was a fabulous art and history museum in the heart of commercial fishing country? With a focus on the fisheries industry and the blossoming of early 20th century art (and Maine art colonies, one of which – Rocky Neck – is five minutes away), the Cape Ann Museum showcases artifacts in 16 galleries on 5 floors throughout three (connecting) buildings. In the 1800’s, most American artists spent time in Europe to hone their skills. But dangers during World War I put the kibosh on travel, so artists began to set up colonies on the Maine Coast. The museum displays the largest collection of the work of Fitz Henry Lane, a Gloucester native and preeminent New England maritime artist known for his use of light and fine detail of ships and seascapes. Lane was one of those talented painters who actually made a living from his craft. One of the highlights of the Cape Ann Museum is a diorama of Gloucester created in 1876 and expanded for the Chicago Exposition in 1893. It was a great source of pride for the town, and though only part of the original takes center stage in the room, it’s quite a meticulous and intriguing miniature reproduction. Another highlight is the dramatic statue of Mary holding a fishing vessel like a baby that once sat atop Our Lady of Good Voyage Church in Gloucester. This is the original – a fiberglass copy was put in its place. This museum is very accessible and compelling – with each artifact offering greater insights into the community. My favorite story was of Howard Blackburn, a Nova Scotia native who came, like many immigrants, to Gloucester in the late 1800’s to seek his fortune in the fishing industry. The late 19th century after the Civil War saw a great demand for fish in America, and Blackburn was just one of many who came where fishing grounds teemed with cod, halibut, and mackerel. One winter day in 1883, he and a dorymate rowed miles from their fishing schooner when an ice storm hit. Seeing no other option to save their lives, Blackburn allowed both hands to freeze to his oars so he could row to safety. Though his fellow fisherman died, Blackburn survived, but lost all ten fingers and most of his toes to frostbite. Even with this disability, he became a successful and celebrated bartender, and then sailed solo across the Atlantic. Twice. Don’t miss the gallery that showcases Folly Cove Designers – a textile printing guild established in Gloucester by Virginia Lee Burton, author and illustrator of Mike Mulligan and the Steam Shovel, The Little House and other iconic children’s books. Folly Cove designers used carved linoleum to “block-print” fabrics that were made into curtains, tablecloths and clothing. The group disbanded a year after Burton’s death in 1968, and the sample books and printed cloth were donated to the Cape Ann Museum. Open Tues-Sat 10-5, Sun 1-4, Guided Tours Tues-Sat 11 and 2, Sun 2, $12 adults, free 18 and under. TOUR/BOAT: Schooner Harbor Tour. Two schooners offer daily 2 hour sails in season around Gloucester Harbor – Schooner Ardelle, and Schooner Thomas E. Lannon. WHALE WATCH: 7 Seas Whale Watch. One of the best whale-watching cruises in New England, 7 Seas guarantees sightings. TOUR: Cape Pond Ice. This ice-making-harvesting company has been “icing Gloucester’s fleet since 1848.” Take a 45-minute tour to see the 150-ton ice-making facility including 300 lb ice blocks, ice sculptures, and to learn the history of the industry that keeps the day’s catch cool. June-Aug open Mon-Fri 9-4, Sat 9-3, Sun 9-12, tours Mon-Sat 11 and 2, Sun. 11, $10 per person. SCENIC/HISTORIC TOUR: Plug-In Tours. Whether your fancy is historic or scenic, there’s a tour for you on these one and two hour small-bus tours of Gloucester and Cape Ann. Starting at $29 per person – check website for times. TASTE/EAT: Cape Ann Brewing Co. The only brewery in town, and right on the commercial fishing docks, you can knock down a “Reel Easy” (New England IPA) or “Tea Party” (Barley wine made with tea) while watching fishing boats coming and going. Situated on the public boardwalk overlooking the commercial docks and Cape Pond Ice building, this brewery is a favorite meeting spot. Head brewer, Dylan L’Abbe-Lindquist, is as adept at fermenting 16,000 lbs of cabbage for sauerkraut and kimchi per year as he is at brewing the flagship Fisherman’s Brews. As a matter of fact, Dylan’s locally sourced, probiotic, vegan – and delectable – Pigeon Cove Ferments sauerkraut is used for Cape Ann Brewing’s excellent Reuben sandwich, which pairs perfectly with a Fisherman’s Pilsner. EAT: Locals recommend Duckworth’s Bistrot for genuinely great food, “close to perfection” Passports, classy/modern Tonno for Catch of the Day, and Causeway Restaurant for New England Chowder. STAY: Beauport Hotel. Gloucester’s newest hotel – a boutique, yet. With its own beach, a roof-deck pool (with great service, according to guests), and chic, breezy rooms, the Beauport is pricey but worth it for the ambiance and in town, on waterfront location. If you reserve on a wedding weekend, ask for a room far from the festivities for a quiet night’s sleep. Rooms from $230 per night.